Last weekend I warned that the alarm bells are screaming very loudly. Stocks would need to begin bouncing strongly and virtually immediately for that to be true. The alternative is that virtually all major worldwide stock indices made a long-term Bull market top last year and we are already in the grip of a Bear market which could last at least another year and, if follows the "norm", will wipe out perhaps as much as 50% of your net worth. And possibly more in the Wall Street markets. The onset of the new Bear is not yet set in concrete. However, it is only a few per cent away and as I said last weekend, it was distinctly possible even before last week's dives, that some markets, such as Australia, are already in its grip. That edition, 2016 ... beware of the Bear, is available under the large blue button on the right. After a week of deep-diving stock markets worldwide, I will review below where we may now be in long-range Elliott Wave terms. It is possible, because of major astrological events last week, that the drop is a head fake. We will begin this report with an updated look at the broad Elliott Wave roadmap, where Bull markets rise in 5 waves. In Forecast 2015, still available under the Archives button, I had drawn the red arrow on the left indicating where we were at the start of 2015. It is possible ... but only just ... that Wall Street still has two more rallies before the current Bull is dead. 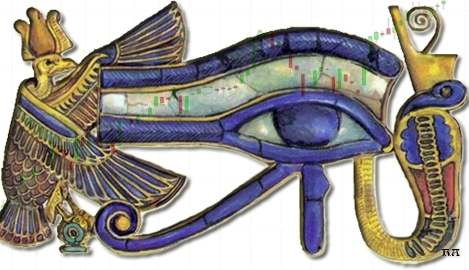 If that is so, those indices are close to where I have drawn the black arrow. However, the very real danger is that the top is in and a large-scale meltdown is already underway. If that is the case, we may already be within the early stages of a crash ... the second part of a crash which has been underway for months. 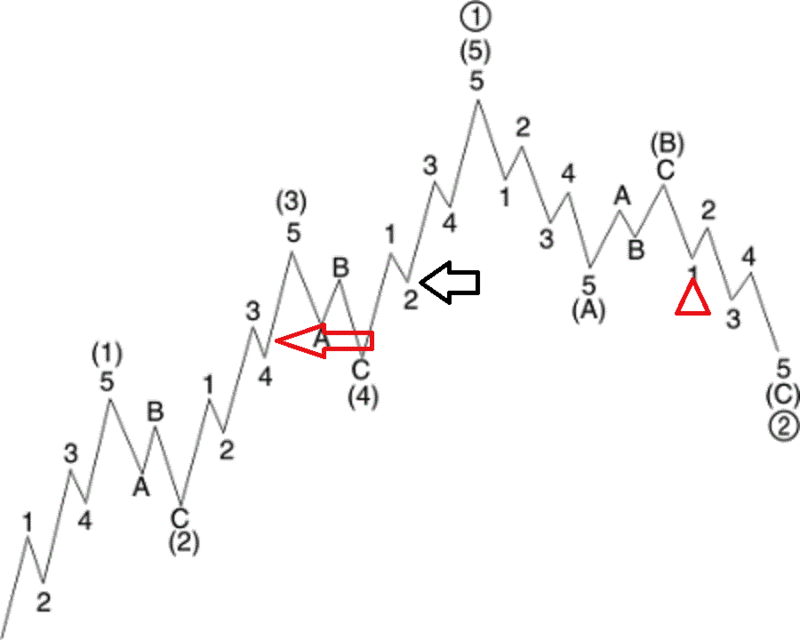 As a rough guide, my best guesstimate would place Wall Street about where the red triangle is positioned. In short, we ALL need to watch the next rally very carefully and be prepared to: Get the Hell Outa Dodge!! 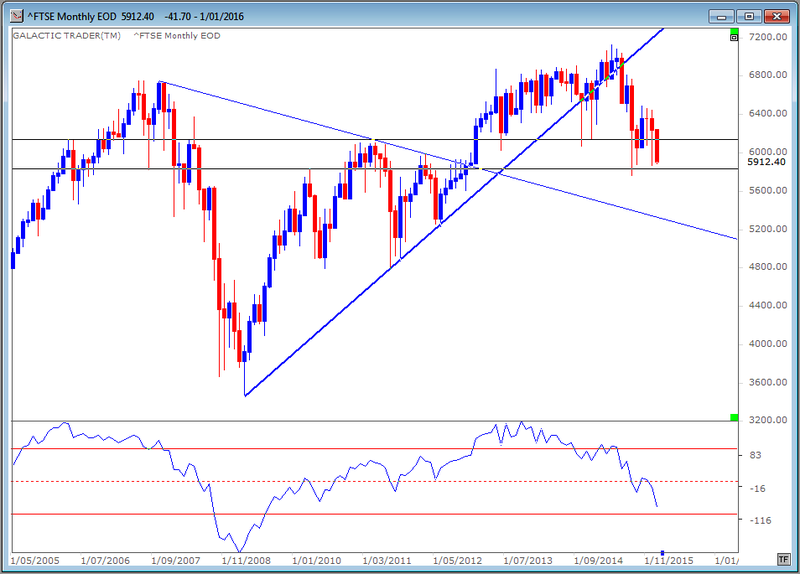 We'll look this weekend at the long-range charts for the FTSE and the DAX. England has slumped back into the price zone marked by the two thin, black horizontal lines. Its position within that zone needs to be monitored VERY closely, because the Big Bird oscillator certainly looks to be in a death dive. If you look at what happened during the 2007-2009 Bear market on the left of the chart you have a graphic illustration of what I mean when I say we may already be in the early stages of a crash. 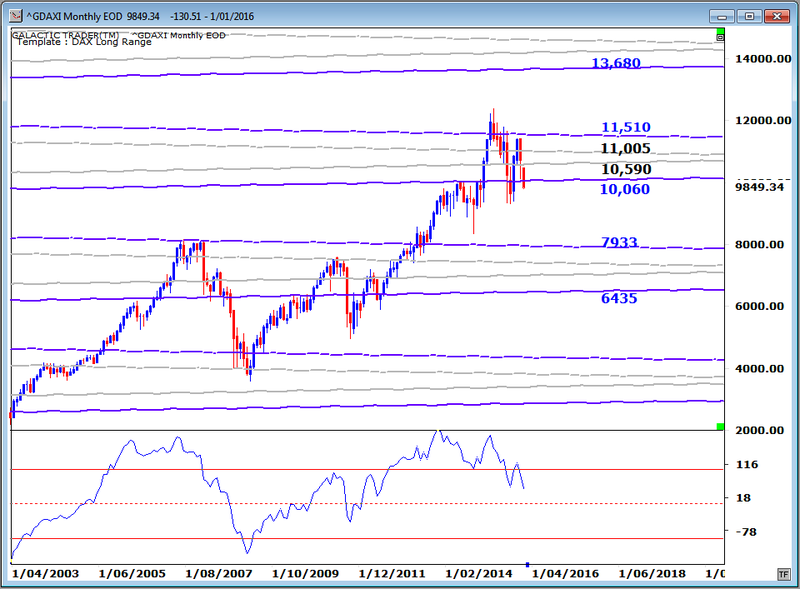 The monthly Idiot is now firmly in Sell mode on Germany's DAX. The blue-line Big Bird oscillator is in deep trouble and so, too, is the red-line Medium Bird, which is clearly warning that more trouble is looming. The green-line Fast Bird is showing some positive divergence, though this will not be settled until the end of the month. Still, it is giving preliminary notification of a potential bounceback nearby. 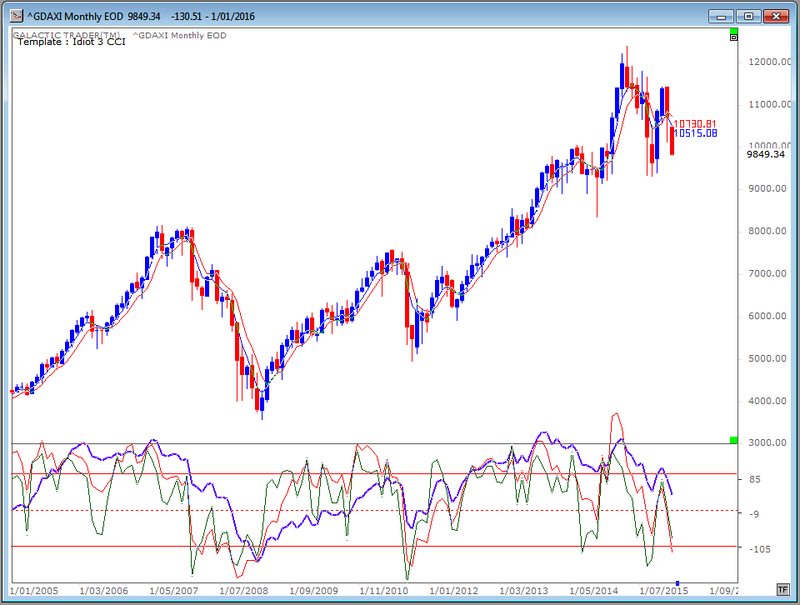 Please note in the chart above that the Fast and Medium Bird oscillators are looking suspiciously similar to their behaviour just before the 2008 crash. Below is the DAX's long-range planetary price chart ... and that's one big hole its price is starting to drop into.